The ability to make those shots is part art and part skill, Wolves' sixth-man Jamal Crawford said. The willingness to take them might even be more meaningful. 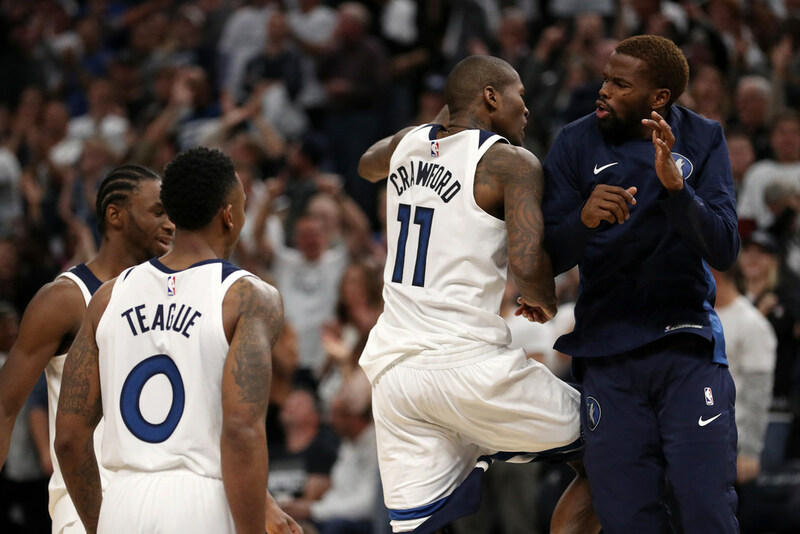 When Jamal Crawford banked in a desperation three-pointer from 38 feet away for the Wolves at the end of the first quarter of their game last week at New Orleans, it was a milestone shot on a couple of fronts. First, it was particularly satisfying for anyone associated with the Wolves to watch Crawford make a desperation heave for Minnesota instead of against Minnesota after the 37-year-old veteran had burned the Wolves multiple times in the past. Second, it moved Crawford to the top of a special list. Per a stat dug out by Wolves/Lynx stat guru Paul Swanson (known affectionately as Swanny), Crawford has now made 10 shots of 35 feet or more in his career. Since the start of the 1996-97 season, no NBA player has made more desperation heaves from that distance (Jason Kidd also had 10 in that span). Crawford has also attempted 160 such launches in his career. On the list provided by Swanson, only Andre Miller (166 attempts, with five makes) had tried more. The ability to make those types of shots is part art and part skill, Crawford said. The willingness to take those types of shots might even be more meaningful. The Wolves have seen it, too — on both ends of the court. During the 2013-14 season, when Crawford was with the Clippers, he twice beat the buzzer at the end of the third quarter against the Wolves. The first was an epic 51-footer on Nov. 11, 2013 and the second was only a 29-footer on Dec. 22 (and hence not one of the 10 on his official long heave list). The Clippers won the first game by two points and the second by four points over the Wolves. His 38-footer last week for the Wolves — after he stole a pass — broke a 28-28 tie and gave Minnesota a lead at the end of the first quarter of a tight game they eventually won by six points. Crawford said he doesn’t have a special spot on the court to shoot from, nor does he care if it banks in or swishes. That sort of selflessness is part of the game for Crawford, who is the only three-time winner of the NBA’s Sixth Man of the Year award. He won the award in 2010 with Atlanta and both 2014 and 2016 with the Clippers. He’s provided a bench spark for the Wolves so far this season, averaging 10.8 points while playing an average of 20.2 minutes for a 7-3 team. He might be eclipsed on that long shot list soon by Golden State’s Steph Curry, who is 8 for 85 all-time on desperation 35-foot-plus heaves. The Wolves and Warriors play Wednesday at Golden State, so you’ll want to pay attention at the ends of quarters. For his career, Crawford shoots 35.0 percent from three-point range. He makes just 6.3 percent of those desperation heaves — better than the league average of 3.7 percent on 35-plus-footers since 1996-97 per that research by Swanny, but still not a high-percentage shot for anyone. I mentioned to him that if you took out his desperation heaves — the 10 makes but also the 150 misses in 160 attempts — his overall career three-point rate would climb by nearly a full percentage point to 35.8 percent. Free agents can start signing today. What strategy will Twins use?